The world has gone cat crazy, and I have to admit, I freaking love it. I have been a cat person for as long as I can remember (don’t get me wrong, I love dogs, but I prefer the stealthy arrogance of cats), so the internet cat boom has served me well. Since I’m obsessed with my adorable little purring machine, of course I don’t mind spending money on keeping her happy and healthy, but all the expenses do add up. 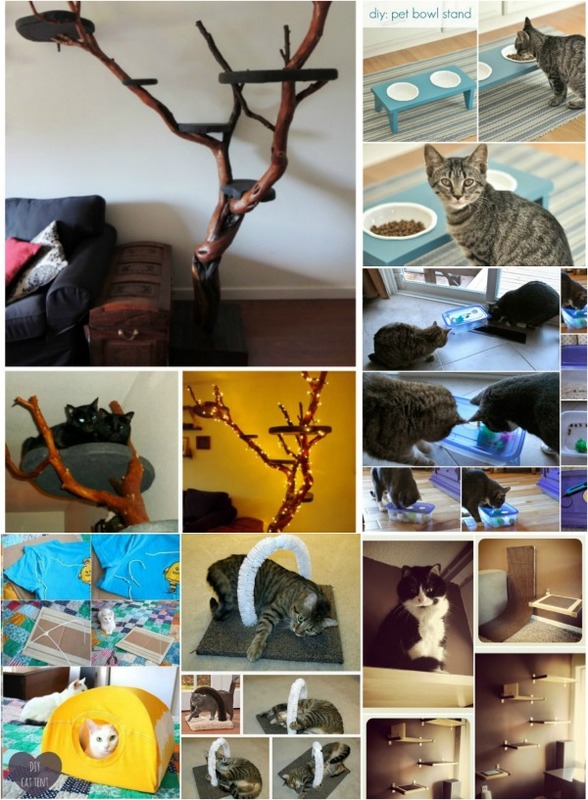 So for all of you who, like me, enjoy getting their hands dirty and saving some money at the same time, enjoy this collection of awesome DIY cat projects. This is a very ambitious project, but if you have the time and means to do it, I would highly recommend it. 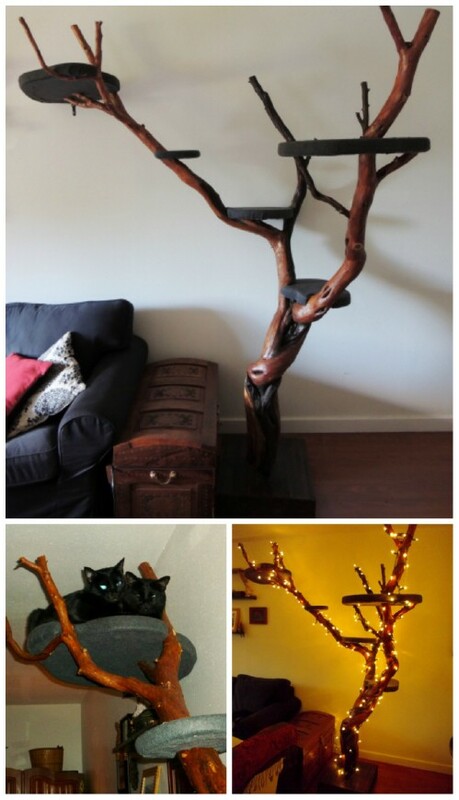 This tree is not only a great natural play area for your cat, but it doubles as a beautifully bold and rustic decoration piece in your home. 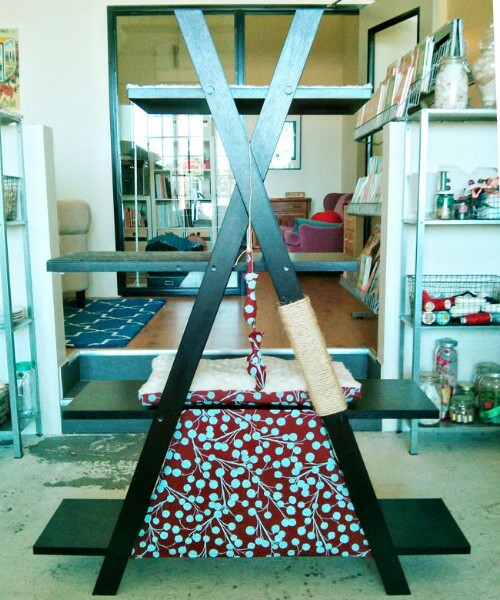 Instead of a large cat tree in the house, install these cat shelves for a sleeker, space-saving approach. It’s pretty straightforward to get done, and your cat gets to climb around and still feel regal when sitting on the highest shelf. 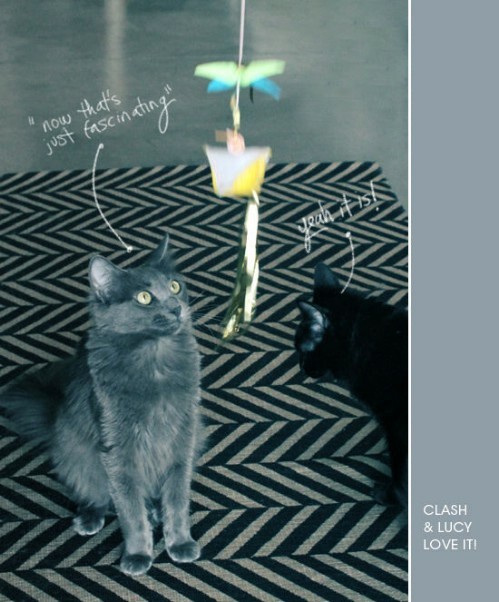 Cats are intelligent, but they need that constant stimulation in play to keep them smart. This treat puzzle is a cinch to make, will hardly cost you anything, and will offer your cat hours of fun and brain training. No one wants to see or smell a kitty litterbox in the house, but if your pet is housebound, then unfortunately it’s just one of those things you have to deal with. Instead of having it so obviously out in the open, conceal it within furniture so that no one is the wiser. I love my cat to death, of course, but she can be very demanding at times when I’m busy working, cooking or eating. So for those times that I can’t pet her, I’ll build this damn near genius contraption so that she can get herself petted and stay off my laptop! If your cat is anything like mine, he kicks his litter all over the place and makes a very unwanted mess. 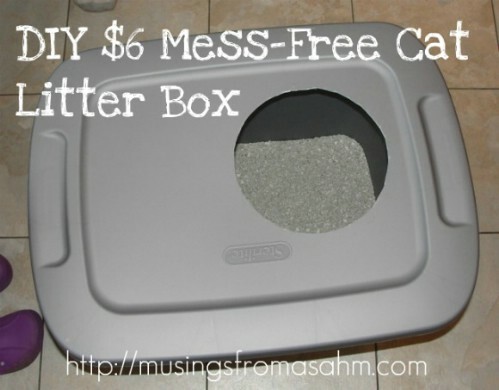 This covered litter box is an absolute lifesaver in this regard; no more gross cleaning up! 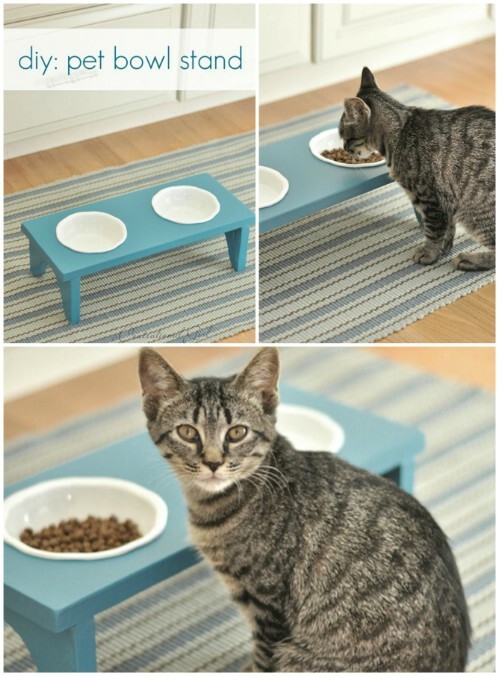 I’ve become much too accustomed to kicking or tripping over my cat’s food and water bowls that simply sit on the floor (and of course, she often tips her water bowl over), so this stand seems to be the perfect project for me. 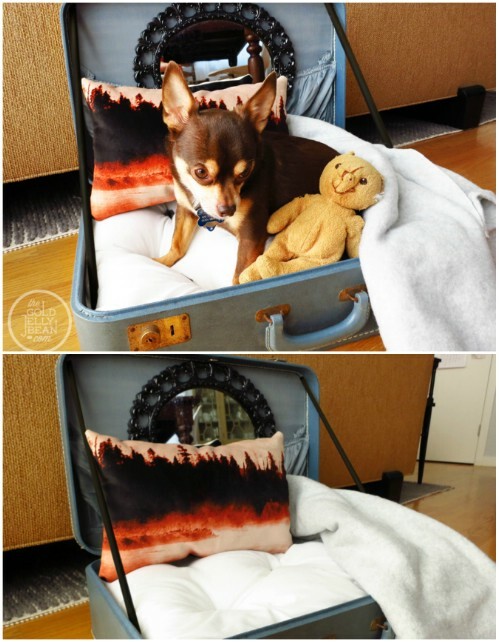 You can paint it plain and simple with your pet’s name on it, or make up an elaborate design; turn into a feature! 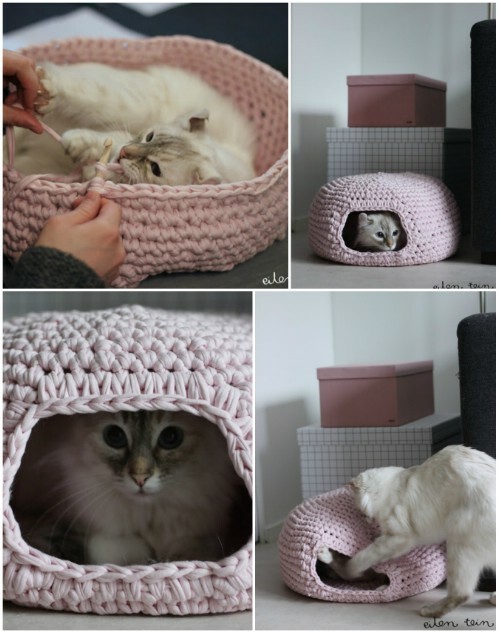 Cats love tucking away in dark enclosed spaces, so why not crochet a cute little igloo-style bed for your fuzzy feline? 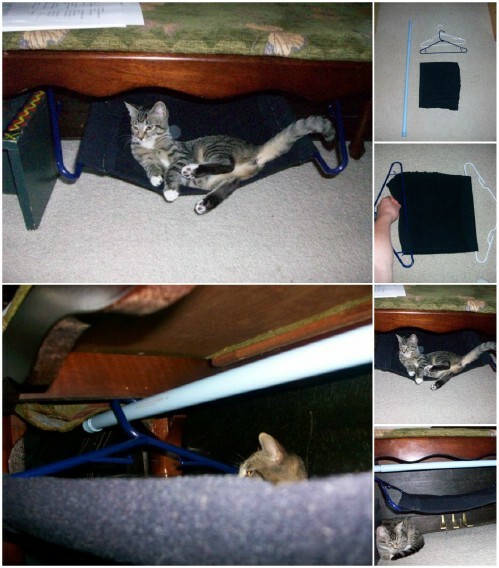 The project isn’t too hard to do as long as you stick to the pattern, and if you use a good carpet or thick t-shirt yarn, the bed will sustain the clawing. Cats love staring out the window; even though mine can simply hop out the open window and actually be outside, I usually catch her just sitting on the windowsill, looking out as if she’s a philosopher contemplating the world. If you don’t have a nice windowsill seat for your cat, make this comfy and fun window perch so that regardless of whether yours is an indoor or outdoor kitty, he still gets to gaze out. 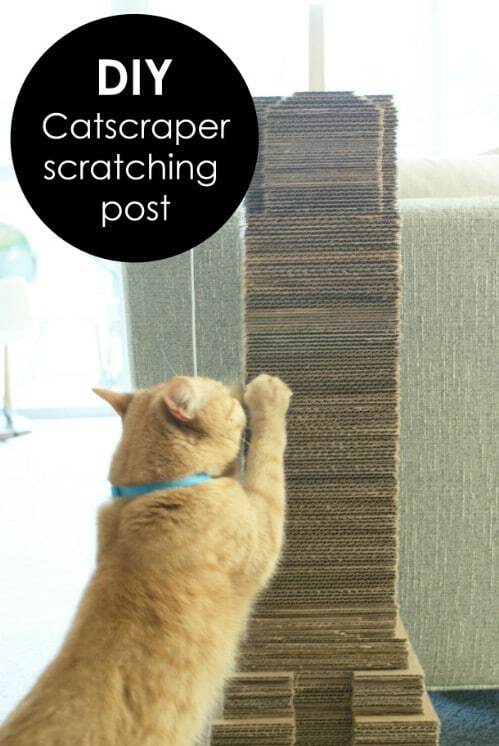 As much as our beloved felines love to sharpen their claws on our furniture, we owners don’t really love seeing our couches, chairs and drapes get torn apart. 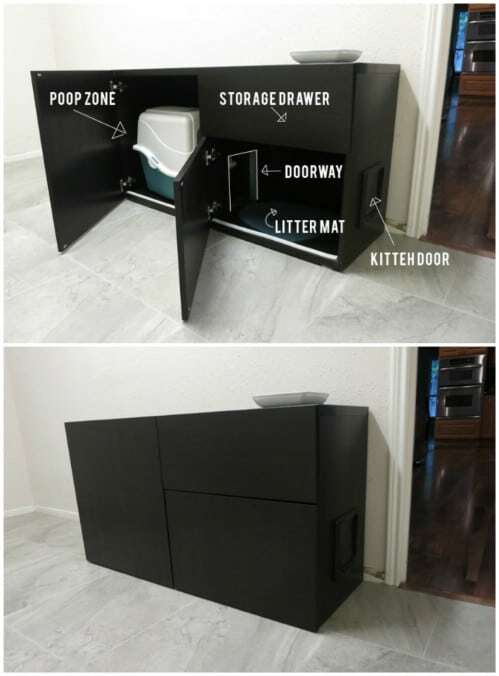 This cat skyscraper is the perfect alternative: it’s super cheap to make, gives you the opportunity to recycle some old boxes, and will hopefully save your furniture. Be aware, it is time consuming, but definitely worth it. Cats love to perch themselves on higher ground and look down on the rest of us mere mortals, but those cat trees that you buy in pet stores can be really, really ugly. Solution? Make your own. 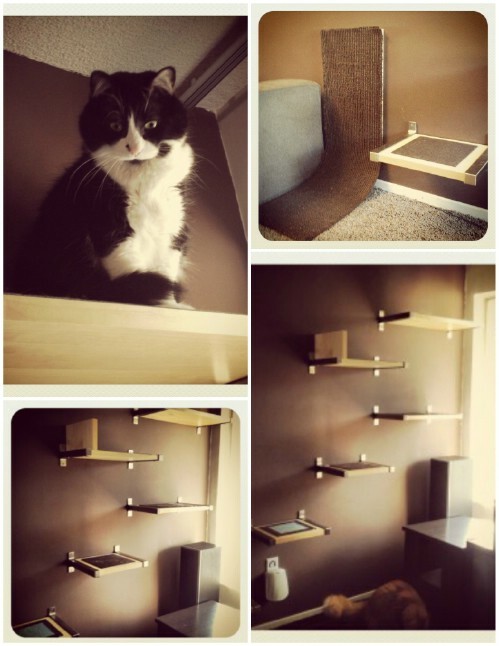 Get your hands on a secondhand A-frame bookshelf and kit it out for your kitty. 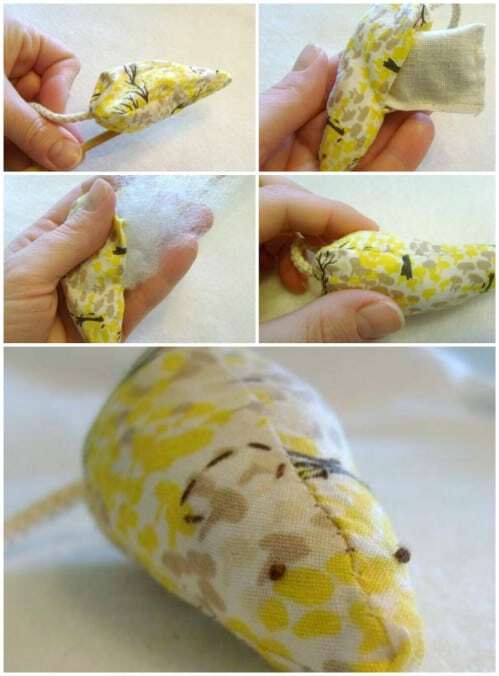 We all know how catnip makes cats go crazy (in a good way) so stuffing a handmade toy mouse with the stuff seems fairly obvious to me! You can use any scraps of spare fabric that you have laying around for this cost-effective project. 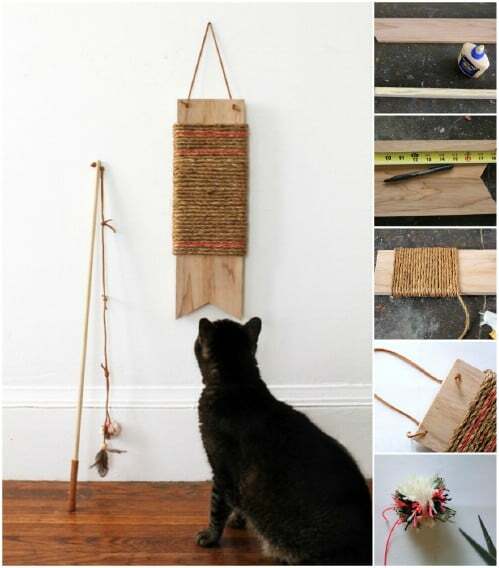 If you don’t really have the space for a massive cat scratcher in your living room, try this smaller scratching board that can simply be hung from a door or wall. It’s nice and compact so it won’t be an eyesore, and the addition of the feathered wand gives your kitty endless playtime. 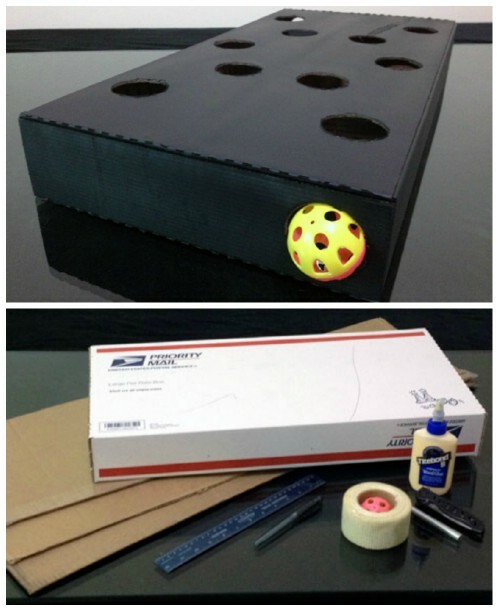 If you do have the space and really want to spoil your cat, then blow him/her away with this ingenious cat rocket made from cardboard boxes. You will need a good amount of time to create this; it’s not something that you can just slap together in one evening, so set a weekend aside for construction. 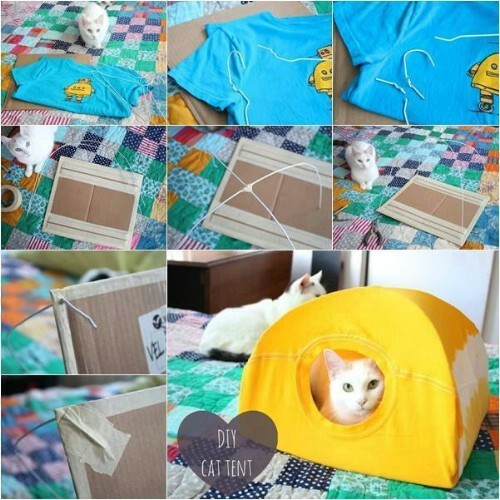 It seems that cats may love hammocks just as much as humans do, so here’s a great set of instruction to make a simple yet effective chill place for your furry friend. All you need in a piece of fabric, two plastic coat hangers and a shower curtain rod. If you’re not into crocheting, here’s a really simple alternative: a tiny tent made from an old t-shirt and a pair of wire hangers. It’s adorable, and should only take up about 15 minutes of your time. 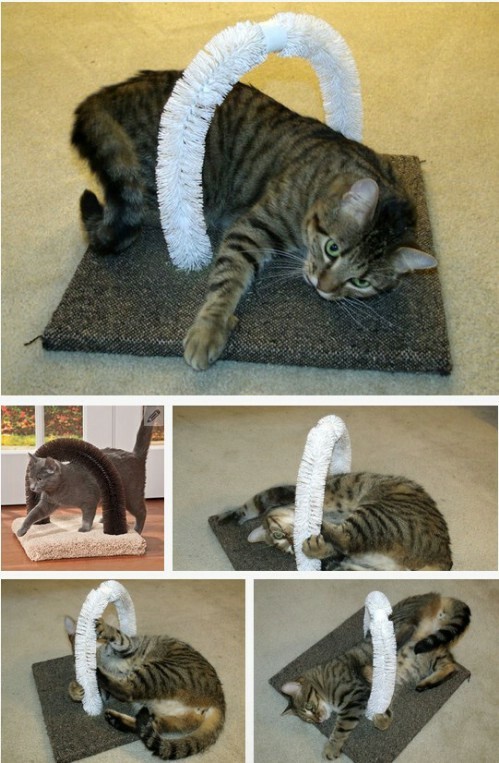 If you want your cat toy to look a little more fabulous than what you’d get from a store, go ahead and make your own! It’s going to be laying around your house the whole time so you might as well make something that you like the look of. This felt wand also contains some catnip for some added enjoyment. If your cat is a strictly indoor kind of pet, surely you still want him or her to be able to safely enjoy the outdoors, like an animal should. 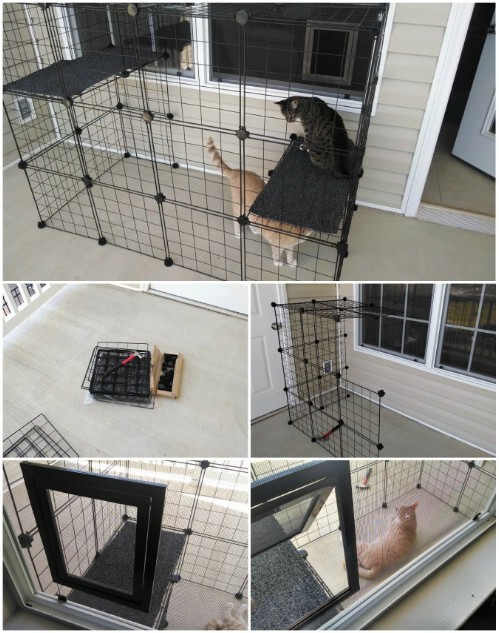 As long as you have a nice shaded area, you can build your own outdoor enclosure so that your cat can laze about in nature. 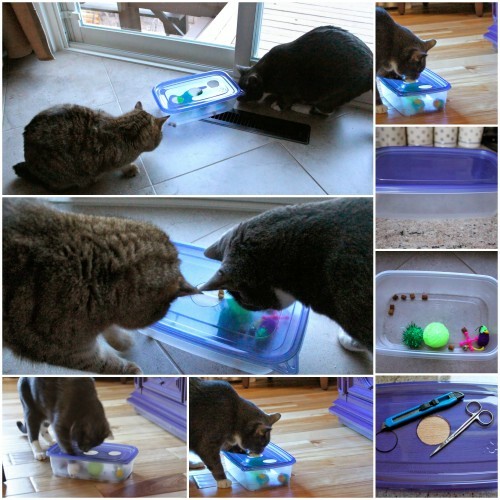 Here’s another one of those educational toys that will keep your cat’s mind sharp during play. Kitty will have to maneuver his toy (that contains a treat inside) through the holes in order to get it out and munch on his reward. Bro it would be much better if u actually showed how to make the diy ? Cats houses are so expensive! So I decided to make it myself. 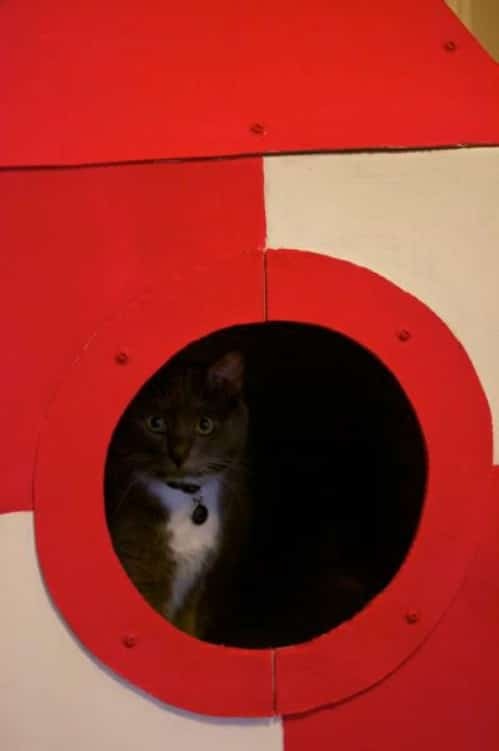 The article https://catspro.com/diy-cardboard-cat-house.html has the easiest instuction. There is a simple way of making it of cardboard. Cheap and convenient. Neko to wa nanidesu ka? What a puuurrrfect website! Happy Caturday! Hello there, You have done a fantastic job. I’ll certainly digg it and in my opinion recommend to my friends. I am sure they’ll be benefited from this website.